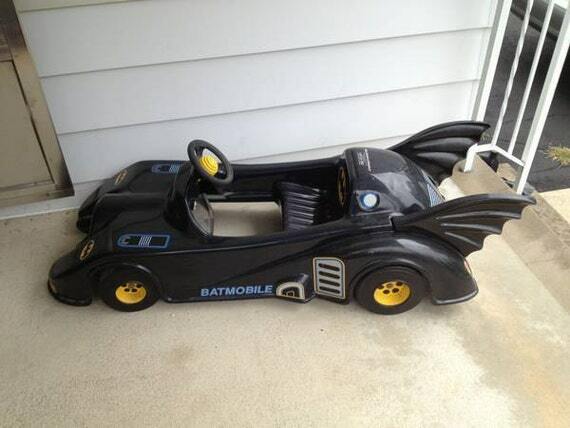 If you’re looking for a batman car for kids, it’s likely that you’ll start with ride-on vehicles. These types of toys are fun, engaging, encourage outdoor play, and come in a thousand different themes and varieties for you and your child to choose from. In addition, there’s some great news: if a batman ride-on toy is what you decide you need, there are definitely some quality options for all budgets. In this section we'll show you different some batmobile toy vehicles options to get you started. If your child has a need for speed and already has some battery-operated ride-on experience, then this Batman ATV is an affordable, high-powered, and exhilarating option for them! While this ATV is built for younger children, the engine is big enough that it will support even pre-teens and young adults with ease. Usually, a child's batmobile car sacrifices speed, but this powerful ATV can travel at a whopping six miles an hour. Sleek and well-constructed, this Batman ATV can even be used for light off-roading and uphill fun. A powerful 12-volt battery of this batman electric car ensures long, fast hours of entertainment. If your child is new to ride-on vehicles, the ATV can be locked in “low-power” mode so that it cannot go faster than 2.5 miles per hour. A fun pretend canon and blue-and-black accents complete this adorable, yet functional, Power Wheels product. When you have a kid that is absolutely obsessed with the style of the Batmobile and wants to feel like Batman riding the streets of Gotham in search of bad guys to catch, this is the ride-on for them. It features a extraordinary; realistic Batmobile styling bound to make any rider feel like they’re in a real batmobile! This 6v batman batmobile electric ride on car also features working headlights making it one of the best batmobile toys for kids. Add a cape, a mask, some tunes, some crimes to bust, and a Batman-loving kid for best results! While this Power Wheels doesn’t have the sleek Batmobile features of the previously mentioned ride-on, what it lacks in design it makes up in power and ability to travel on almost any surface with ease. From wet grass to rocky terrain, the Power Wheels Batmobile Dune Racer has the power to travel it. Just because this Power Wheels might not look like a Batmobile doesn’t mean it doesn’t act like one! With cool Batman decals and batwing front fenders, any Batman fan will enjoy the overall theme of this dune racer. This car goes a max of five miles an hour and features “Monster Mode” that allows it to power along multiple terrains including ruts, water hoses, rocks and even medium hills. The frame is made out of sturdy metal and can handle up to 125 pounds without issue. The best part? When your junior crime fighter wants to bring their Robin along, they can - there is room enough for two! Simply the best batmobile power wheels ride on for two kids. Not every Batman-in-training can adventure outside all of the time, especially in places where it rains a lot. Not every toddler is ready for an electric batman car or any powered ride-on vehicle, but still wants to work on their criminal-capturing skills. So what is a parent to do? Purchase a different and house-friendly ride-on vehicle instead, of course! The Little People batman car for toddlers is a fantastic, fun addition to any household with toddlers. This little car has some adorable features like phrases and sound effects, Batman music, and flashing lights for the amusement of its riders and their friends. A secret compartment under the seats provides a perfect place for all of that secret Batman equipment, and a handlebar on the back of the vehicle ensures easy parental intervention for the over-excited toddler. This is an extremely affordable option for those with younger kids as this ride-on is perfect for teaching kids the basics of ride-on equipment. Vrooom! Go Karts are wonderfully fun inventions that have come back into popularity in the last few years. They are slick, fun, no-battery devices that use bike pedals for all of their forward motion, encouraging both exercise and outside play! The innovative 3-point steering makes this Batman Go Kart a great way to patrol Gotham - or just your neighborhood. This Go Kart would be a great addition to any family, especially one with multiple kids so that multiple Karts could be purchased and raced. A quick-response hand brake makes the speed easy to control, and an adjustable, padded seat ensures that almost any child will fit. To answer your question, of course this Batman Go Kart comes with Batman features? With cool decals and a slick, smooth black and blue appearance, this Go Kart definitely gives the other batmobile ride on toys a run for their money. Because it is entirely foot-powered, just riding on it builds strength and coordination in children four to eight years old - especially if they’re racing! When your Go Kart needs a little extra Batman, then the Batmobile Go Kart is obviously the right decision for you and your family! This Go Kart is modeled after the modern Batmobile, and features a sleek, detailed front end that looks like the real thing - only a bit smaller. Batman decals complete the Batman feel of this Go Kart. The handbrake halts both back wheels for extra control on wide and dangerous turns, and an adjustable bucket seat ensures a great and smooth ride for crime-fighters both big and small. The sporty design of this Go Kart makes it more appealing than other battery powered batmobile because the pedal power ensures a faster, smoother ride. Last, but not least, when you need an affordable and easy to maintain option for your little hero, this Go Kart is the way to go; while it isn’t the cheapest Kart on the market, it is most certainly of a grade A quality that will last for many years to come. This ride-on is another great option for indoor play for smaller children, especially on days when going outside just isn’t an option. This batmobile ride on car has a lot of the great, standard features of indoor ride-ons targeted at children under two, it also has an excellent addition: the front converts into a raceway for Batman cars! This car comes with two little cars that your toddler can race down the front before they store them away in the storage compartment under the seat and fold up the race way for another zoom around the house. This ride-on also includes cool batman sounds, flashing lights, and the most fun catch phrases. Though this ride-on only comes with two cars to race down the foldable speedway, more can be purchased in the form of Batman, Batgirl, The Joker, and Robin for added delight. This car is an excellent, affordable choice for young kids, especially if they have a friend over to race cars together. Trikes are a great transitional tool between a bike and walking, so why not do some patrolling while you’re learning? This Batman Lights and Sounds trike is not only adorable and affordable, it is extremely well-built for any child under the age of five. Your toddler can fight for justice and outsmart his enemies while pedaling around the neighborhood and communicating with Batman on with the light-up walkie talkie, creating a fun and creative environment where your child can stretch their imagination! With a storage compartment for a mask (or a pair of sunglasses), three adjustable heights, and working blinkers, this little trike is fun for all small fans of Batman. Are you looking for something a bit more on the original side? The name “Power Wheels” has been around since 1984, when the company started to product battery-powered ride-on toys. However, newer versions are made of plastic most of the time - if you want a metal ride-on, here’s your chance. Vintage batmobile pedal cars are making a comeback and are made of quality materials that will not simply fall apart over time. The original Power Wheels cars were built to last forever. Equipped with a new, safer 12-volt battery, this electric Batmobile car is ready to patrol the streets again with its sleek body design and batwing fins! If you would rather purchase it for your collection, that’s an option too, as many of these Batmobiles - including this one on Etsy - are in excellent condition and will display quite well. It’s okay if you want to be a big kid, too - just remember you probably shouldn’t ride in it! Whether you’re looking for a Batman ride-on for kids, for yourself, for toddlers or even for babies, you can find an affordable option that will please even the pickiest of Batman fans. Which is your favourite batmobile ride on toy? Do you prefer electric batmobiles or non electric powered batmobile toys? Let us know in the comment section below.